McCain ally Sen. Lindsey Graham, R-SC, and Rep. Rahm Emanuel, D-Ill., Obama’s incoming White House chief of staff, will be there. Graham and Emanuel worked well together on negotiating the presidential debates. In May, Obama alluded to putting McCain in his Cabinet when discussing how former President Abraham Lincoln put rivals in his Cabinet. There is no indication Obama intends to offer McCain a position in his Cabinet, or that McCain would accept, but the two are expected to discuss areas where they can work together — the environment and national service, for instance. On the day that President-elect Barack Obama visited the White House, a new national poll illustrates the daunting challenges he faces when it becomes his home next year. Only 16 percent of those questioned in a new CNN/Opinion Research Corporation survey released Monday say things are going well in the country today. That’s an all-time low. Eighty-three percent say things are going badly, which is an all-time high. “The challenge Obama faces has never been greater. No president has ever come to office during a time when the public’s mood has been this low. In the 34 years that this question has been asked, the number who say things are going well has never fallen below 20 percent,” said Keating Holland, CNN’s polling director. The 83 percent saying things are going badly is “more than in 1992, when the first President Bush was ousted because of ‘the economy, stupid.’ That’s more than in 1980, when President Carter got fired after the malaise crisis. That’s more than in 1975, after Watergate and the Nixon pardon,” said Bill Schneider, CNN senior political analyst. So far, Obama seems to be meeting the public’s high expectations. Two-thirds of all Americans have a positive view of what he has done since he was elected president, and three-quarters think he will do a good job as president. 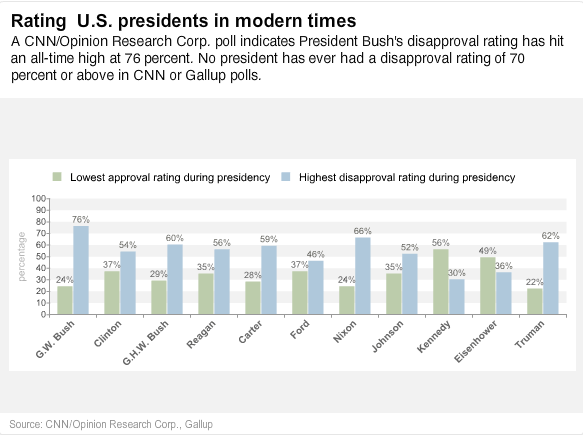 The all-time low on the public’s mood may have something to do with the poll’s finding that President Bush is the most unpopular president since approval ratings were first sought more than six decades ago. Seventy-six percent of those questioned in the poll disapprove of how he is handling his job. That’s an all-time high in CNN polling and in Gallup polling dating back to World War II. — Rep. Robin Hayes (R-NC), quoted by Politico. When confronted, the congressman’s staff denied he said it, but the audio proves otherwise.